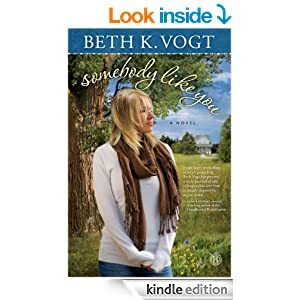 Somebody Like You by Beth Vogt is a wonderful piece of fiction. I still find myself thinking about the characters and the story-line days after finishing the book. Can a young widow find love again with her husband’s reflection? Haley’s three-year marriage to Sam, an army medic, ends tragically when he’s killed in Afghanistan. Her attempts to create a new life for herself are ambushed when she arrives home one evening—and finds her husband waiting for her. Did the military make an unimaginable mistake when they told her Sam was killed? Too late to make things right with his estranged twin brother, Stephen discovers Sam never told Haley about him. As Haley and Stephen navigate their fragile relation­ship, they are inexorably drawn to each other. How can they honor the memory of a man whose death brought them together—and whose ghost could drive them apart? Somebody Like You is a beautifully rendered, affecting novel, reminding us that while we can’t change the past, we have the choice to change the future and start anew. From the very beginning, I was drawn in and fascinated by the characters and the plot. Beth Vogt has a way with words and made the characters so believable and real, and I felt like I really knew them. The plot about Haley becoming a widow resonated with my deepest fear, and it caused me to really think through how I would cope if anything were to ever happen to my beloved husband. There were so many twists in the story that I didn’t expect! Be prepared to have many emotions touched by this work. It is well worth the read! I received a copy of this book from Howard Books in exchange for my honest review.